The way I have traditionally worked is through the use of contact sheets. 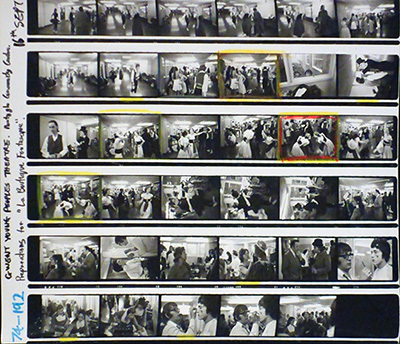 In the days of film, this was often the second process in the photographic workflow, and involved cutting up the developed film into strips of negatives, and laying them onto a sheet of photographic paper, usually 8" x 10" or A4, in the darkroom, covering them with a sheet of glass to keep them flat. They would then be exposed to light and processed in developer to turn the negatives into positive prints, making them easier to see. A frequently used method when reading contact sheets was to go through the sheet marking the first choice of the good images with a white chinagraph pencil. This would be cut down on second viewing, marking the better images with a yellow pencil. After much deliberation, only the best of these would be marked with a red pencil, and these would be the ones chosen to be printed. They can either be kept as a digital file and viewed on the screen, or be printed out, just like the traditional photographic contact sheets.